A worker at Audi's plant in Neckarsulm, Germany, organizes parts used on the A8. Audi says that today's robots cannot deal with the complexity facing their human colleagues, who assemble six model lines and 21 vehicle derivatives at the factory using roughly 56,000 parts from 1,200 suppliers. From the moment they were created, the pair known as "Heidi" and "Erin" were destined to be with each other their whole lives -- or at least as long as their Audi A7 wasn't involved in a crash. In Neckarsulm, Audi's most flexible plant, driver-side airbags are named after girls, while the steering wheels have boys' names. Other components are designated according to seasons or places -- anything to help make it easier for production workers to remember when sorting and installing them. While a robot could read any of their 12-digit product identification codes in a microsecond, auto executives say they could not deal with the enormous complexity facing their human colleagues, who assemble six model lines and 21 vehicle derivatives at the plant. "Today it would be impossible to add all the sensors necessary to replace the human sense of touch," Audi production boss Hubert Waltl said. "People can reach into a box and without looking immediately recognize a larger part from a smaller one." The trend toward an ever expanding range of niche models and individualization options creates a nightmare for logistics managers and it may also be reversing the previously unstoppable march toward greater automation. This contrasts starkly with the widely accepted view that smart factories and intelligent computer algorithms will lead to increasingly fewer workers. Oxford University published a study in September 2013 that said 47 percent of U.S. employment is at high risk of being replaced by a machine in one to two decades as an increasing number of skilled professions are computerized. Switzerland, where manufacturing jobs were hit hard by the strong currency as investors piled into safe haven assets such as the Swiss franc, held a referendum in June as to whether each citizen had a right to an unconditional basic income. To symbolize their fears that machines were increasingly crowding them out of the workplace, hundreds held a rally in Zurich in April dressed in cardboard robot costumes urging "fellow humans" to vote in favor of the proposal, which failed. One German blue chip CEO, Frank Appel of Deutsche Post, even proposed last month incentivizing companies to maintain their workforce by taxing the work performed by robots. German scientists are alarmed that not enough is being done ... for the machines. An expert commission delivered its annual recommendations to the government in February, warning for the first time that Chancellor Angela Merkel must devise an explicit strategy to increase the use of robots in both the manufacturing and service sectors. Throughout the nation's educational institutions, "robotics should be granted a much higher importance that has been the case previously," the commission recommended. The panel of scientists said the number of domestic industrial robots rose only by 7 percent between 2011 and 2014 compared with double- or even triple-digit growth rates in other major manufacturing countries such as China. As a result, they forecast Germany will drop two notches to fifth place this year. The national commission's most recent figures show its carmakers in particular risk being overtaken by their closest rivals because they employed 1,149 robots per 10,000 workers -- fewer than Japan and only as many as the U.S. and South Korea. Traditionally machines are almost entirely used in those parts of the factory where work is exceedingly strenuous, dangerous and requires absolute precision, including stamping sheet metal, welding body frames, or gluing windshields in place. They are also deployed when absolute, cleanroom-like conditions are required, such as when layers of paint are applied to a vehicle. "When you walk through this plant, in the press shop, the body shop, or the paint shop, there are not many people working there; maintenance staff and so on of course, but it is already fully automated," BMW production chief Oliver Zipse said about the automaker's Munich factory. Carmakers are now also experimenting with new collaborative approaches that would see flexible, small-scale robots working alongside humans on the assembly line for the first time. Previously robots have been hulking in size, incapable of performing other tasks elsewhere in the plant, and kept behind a cage to protect employees from injury. After receiving safety certification, Audi has been testing a robot at its Ingolstadt factory building the A4, A5 and Q5 models that hands coolant expansion tanks to line workers without the need for any protective fence. Unlike the thousand other robotic arms that weld, glue and solder parts of the body, it is the only machine to have a name – Adam, symbolic for first of its kind. 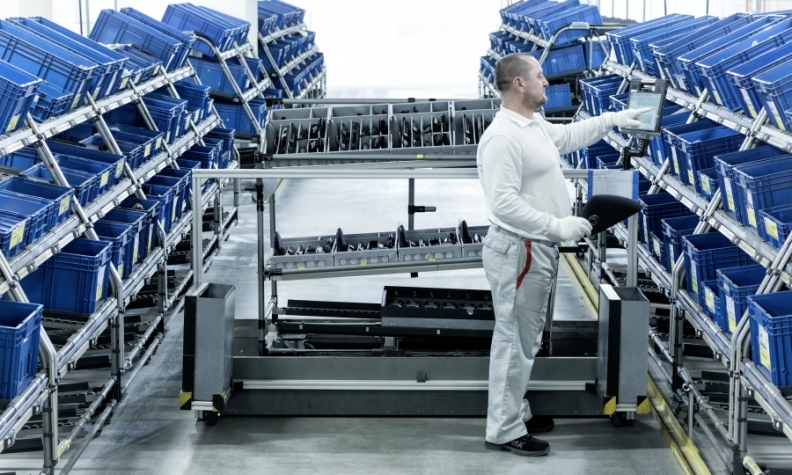 So far the experience has proved successful and Audi expects to begin using one in Neckarsulm by the end of this year to assist with assembling tailgates. 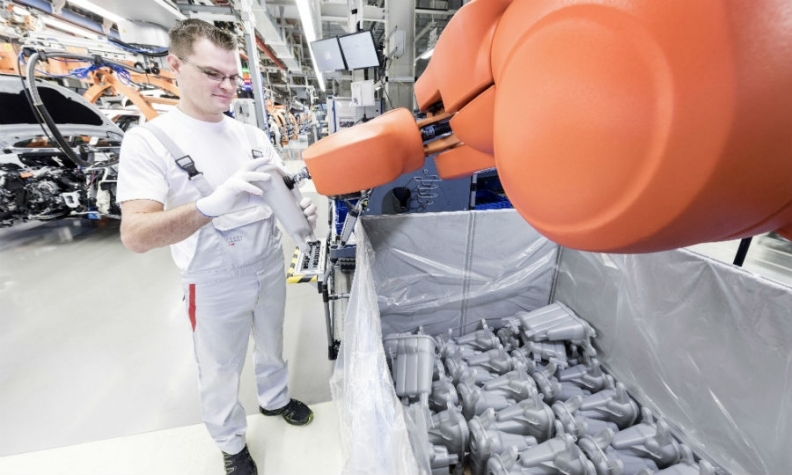 A robot hands coolant expansion tanks to a line worker at Audi's Ingolstadt factory. Previously workers had to bend over to carry out the task risking back problems because of frequent repetitions. Volkswagen has employed a similar helper robot to assist during powertrain pre-assembly at its Wolfsburg plant since late May. Ford, meanwhile, unveiled a small robot last month that is used in two work stations at its factory in Cologne. Ford claims the robot "can be programmed to do everything from make coffee to give you a head massage." Carmakers argue this new approach is driven mainly by the need to boost efficiency in an aging society through more ergonomically sustainable working stations. Zipse, for example, has a target of lowering BMW's factory costs per unit produced by 5 percent annually. German unions worry however that machines such as Audi's Adam could set a precedent in their highly organized car factories. "Robots would finally make their way onto the assembly line," said one union representative, fearing that might only be the beginning. The fear is justified. The push toward smart production plants that are digitally networked and equipped with data analytics software, known in Germany as Industry 4.0, has massive workplace implications. Low- and medium-skilled jobs in manufacturing sites, such as forklift drivers to move parts around, are at risk. "The first place where you will see autonomous vehicles is not on the road but in factories," BMW’s Zipse predicted. Yet while it may appear robots will one day supplant humans, the BMW production boss does not expect a factory such as Regensburg – where nine different derivatives all run off one production line – to be operated without people. "The world is waiting for that," Zipse admits, "but you will not see that … not even with Industry 4.0." Premium carmakers that offer highly individualized models in low volumes argue that the increasing complexity and streams of goods flowing into factories means the problem solving capability of humans is more important than ever. "We’ve overstepped the limits of automation, there's no question," said Markus Schaefer, head of production and supply chain management at Mercedes-Benz. He is convinced the industry's tentative moves in the other direction represent a paradigm shift. For example, around 1,200 suppliers deliver roughly 56,000 parts to Audi's Neckarsulm factory – some of which are scarcely different and only exist to fulfill the various regulations in certain markets. Trying to build a robot that would have the same dexterity needed to sort tons of material into individual boxes would be extremely expensive and ultimately inefficient. Instead, so-called "pick-by-voice" and "pick–by-light" procedures assist employees in stuffing shopping carts full of components destined for the assembly line. This helps prevent the risk of dipping into the wrong box of parts, a mistake that can be costly for the manufacturer should the line be held up to fix a problem or, worse, parts exchanged after a car has already been assembled. Volvo is reconsidering how it uses robots. "We are taking a small step back when it comes to automation because we saw in Torslanda that we have gone a little bit too far," Lars Wrebo, Volvo senior vice president of purchasing and manufacturing, said about the automaker's main plant in Sweden. Mercedes' Schaefer does not believe that collaborative robots or indeed any machine will replace his workers. "Robots behind protective fences are very capital-intensive and limited in their flexibility," he said. He views robots more as an aid for his workers, who will have an increasingly hard time lifting a heavy plate of steel such as a trunk lid or car door hundreds of times a day as they get older. For example, the average age of workers at the Bremen plant, which builds the Mercedes C class for most of Europe, is around 44 years. This makes it the company's oldest across Germany, a country that already is facing a demographic trap. "We are going more toward de-automation in plants in our global production network," Schaefer said. Mercedes' U.S. plant in Tuscaloosa, Alabama, now has a human installing cockpits with the help of a machine, replacing the robot that was there before. Only a healthy human workforce is flexible enough to cope with the problems stemming from the variety of products and sheer range of individualization features that change from one vehicle to the next. Volvo's Wrebo agreed: "If you have too much automation you are too vulnerable. You need to find the sweet spot."